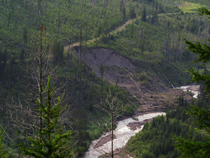 After telling its newly convened Forest Planning collaborative to use its draft 2006 Plan revision as a starting point, the Flathead has now instead distributed a Modified 2006 revision to the collaborative. 1. Abandon Forest Plan Amendment 19 and its securing of grizzly bear habitat through limits on roads and motorized vehicles. 2. Greatly expand the "suitable timber base" where commercial logging is scheduled, partly by logging in areas previously set aside as grizzly bear "security core" under Amendment 19. 3. Retain and expand already extensive snowmobile areas established by Forest Plan Amendment 24, while not proposing to reduce snowmobile areas to protect grizzly bear denning, wolverine and lynx. To make matters worse, the Flathead is playing favorites to the Whitefish Range Partnership collaborative, which has already largely agreed with the Flathead's modifications for the North Fork Flathead. Click here or below to read our letter to local newspaper editors, which includes links to a couple news articles demonstrating the Flathead's unacceptable favoritism and skewing of the Forest Planning process. We're working hard to insure your voice can be heard during the Flathead Forest Plan revision process and will advise you of specific points when your comments will be most useful. Meanwhile you can track or join the revision process at the Flathead National Forest's web site and at Meridian Institute, the contractor the Flathead has hired to attempt to sidestep certain requirements of the Federal Advisory Committee Act (the Forest Service cannot ask for collective advice during meetings that it controls, so it hires a contractor to control the meetings). It is truly disappointing to watch the Flathead National Forest make a mockery out of the Whitefish Range Partnership collaborative and its Forest Plan revision public involvement process. In local newspapers the past week, the Forest Service demonstrated its utter lack of objectivity and fairness when it comes to public input. The Flathead Forest Supervisor told the WRP "This may be very close to, if not exactly what we end up doing," praising them also for being "first out of the chute. " (Flathead Beacon 11/27/13). This even though he has not yet had his staff or the general public assess the environmental impacts and merits of the proposal. The Supervisor's right-hand man made things even worse when he said that those folks that weren't invited to be a part of the WRP could later "take pot shots at it. " (Daily Inter Lake 11/30/13). What better way to disenfranchise an American public only recently invited by the Flathead to participate in revising its Forest Plan through both a collaborative and a broader public review and comment process? Ethics, common sense and the law require that the Forest Service not play favorites. The Forest Supervisor and his staff should have thanked the WRP for its proposal and said it would be considered right alongside the many other proposals it will be receiving during the Forest Plan revision process. The Flathead National Forest belongs to all Americans, not just those that live locally or able to participate in a lengthy collaborative process. That is why the law requires that all proposals be submitted to the entire public for comment - and that those comments be regarded as something more than just "pot shots."